This article is meant to be a short and straight analysis of the current state of the Legacy format according to the last 2 big tournaments: Star City Games Open Series 2011 – Boston (268 players) + Spanish Legacy Nationals – Alcoy (318 players). I’m not going to judge wether Legacy is a healthy format or not. I’m leaving that to you and to the mtgthesource.com community. Right now I’m just going to focus on the numbers obtained by the most played decks in these two tournaments. Discover what’s hidden behind the deck numbers right after the break! 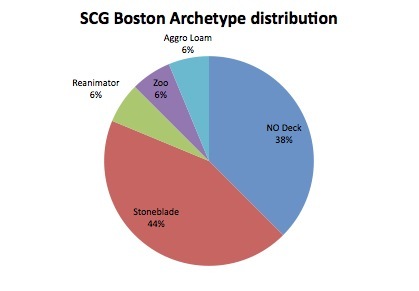 As we can see in the first chart, there’s two clear archetypes that dominated the Boston tournament: NO RUG and Stoneblade. Both playing blue but with a different end-the-game strategy: Natural Order or Stoneforge Mystic. 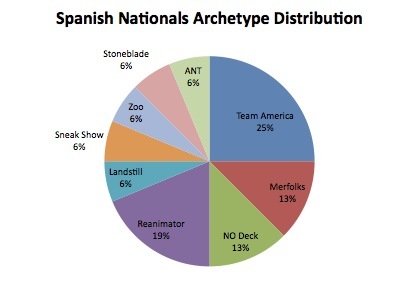 In the second chart (Spain), the deck distribution is more balanced featuring up to 9 different archetypes and with only one deck with outstanding numbers: Team America. Your chances of making top16 are really poor if you aren’t playing blue cards like Force of Will, Mental Mistep and Brainstorm. If you aren’t going to play blue but want to make a top16 performance, you can only play Zoo. I could do the exact same analysis for every other card played, including Natural Order and Stoneforge Mystic, but I focused the analysis on these three blue cards because they are the ones clearly dominating the format. So, in my opinion, it’s not about Natural Order or Stoneforge Mystic, and surely not about Show and Tell like many people complain about. I believe it’s about how Mental Mistep has impacted Legacy in addition to the other two blue Legacy’s MVP, Force of Will and Brainstorm.